It's still really good to "be like Mike." Basketball great Michael Jordan makes more money in retirement than most professional athletes do when they're at the top of their game. New court documents provide a detailed look at just how much the basketball superstar earns from endorsements long after his playing career has ended. They were released as part of a suit Jordan has brought against Safeway, which alleges that one of its former grocery stores, Dominick's Finer Foods, used his likeness without permission. 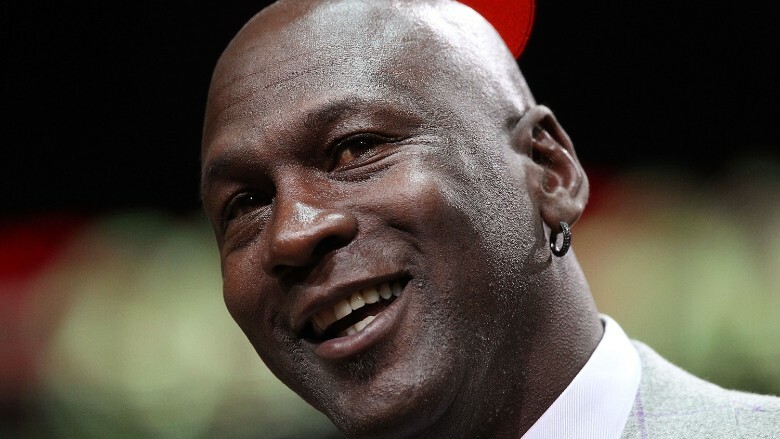 Jordan, 52, is seeking over $10 million from the now defunct company, and the details about his existing endorsements were revealed to support the claim that his image is in fact that valuable. The specifics of Jordan's sponsorship deals clearly demonstrate just how valuable Jordan's image is, according to sports marketing expert Bob Dorfman. Some companies behind these endorsements fought to keep the details of their agreements private, but federal judge John Blakey ruled that the information had to be disclosed to the public in an order signed Thursday. Jordan's most lucrative deal is with Nike (NKE), which has paid out over $473 million dollars over the course of the contract, which he's had since 1993. 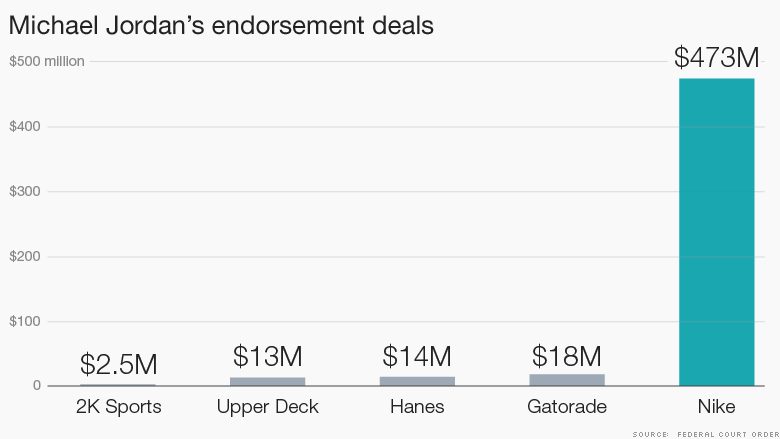 A 1991 deal with Gatorade that's still in effect today is valued at $18 million and a deal he's had with Hanes (HBI) since 1992 has netted him over $14 million. The sports memorabilia outfit Upper Deck paid Jordan over $13 million from 2000-2014, while video game outfit 2K Sports has had two separate contracts with the superstar for a total of roughly $2.5 million. Hanes confirmed how much Jordan's contract is worth, but refused to comment further. Gatorade told CNNMoney that the company does "not comment on pending legal matters." Nike, Upper Deck and 2K Sports did not respond to requests for comment. Jordan, who retired for the third time in 2003, took the notion of athletic sponsorships to an entirely different level, making himself one of the biggest name brands in sports history. "He's an example for other athletes who are focused on creating their personal 'brand,'" Dorfman said. This sentiment was echoed by Marc Ganis, president of SportsCorp. "Jordan is very strategic about the deals he makes," Ganis said. "His image is guarded zealously and he only makes long-term deals for big money that convey a positive image of the Michael Jordan brand." Ganis praised Jordan's savvy ability to cultivate his image and extend his worth long after his career, likening it to that of Arnold Palmer. "His brand will probably continue to be valuable even when he's no longer alive."